Todays post is a quickie- I had to do them this morning instead of last night... apparently last week and the weekend's event s finally caught up with me, because I fell asleep on the couch at 7:30 without doing my nails...GASP! I used OPI Russian Navy matte which pretty much looks like black matte when it dries, same as Lincoln Park after dark. I'm kinda bummed. In the bottle its gorgeous. 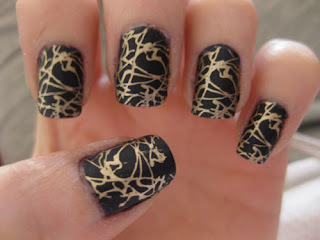 The gold design is China Glaze 2030 from Khrome Collection I can't say enough about how beautiful these 'Khromes' are. one coat and they are perfect- great for Konad... I used Konad Plate m70 for the design. That's so gorgeous. I need to get my hands on some of the Khromes! I highly recommend it. The names in my posts are links to where you can buy them from! a couple of the colors seem pretty similar in the bottle, I need to swatch them to see for sure tho. I bought them all except the more 'normal' silver, because I really like Zoya's Trixie, which is relatively similar. Gorgeous mani! Love the navy/gold combination as well as the different finishes. Great job! I really want to try this how do you apply the Khrome? how did you put the gold on? Looks awesome,love the black background in the design, they must be great with a black dress.